Bradycardia involves having a heart rate of less than 60 beats per minute, decreasing blood and oxygen flow to your brain, according to the American Heart Association. Your age and physical condition determine whether this rate is good for you, with physically active individuals typically having resting heart rates less than 60 and elderly or inactive individuals being prone to health concerns. 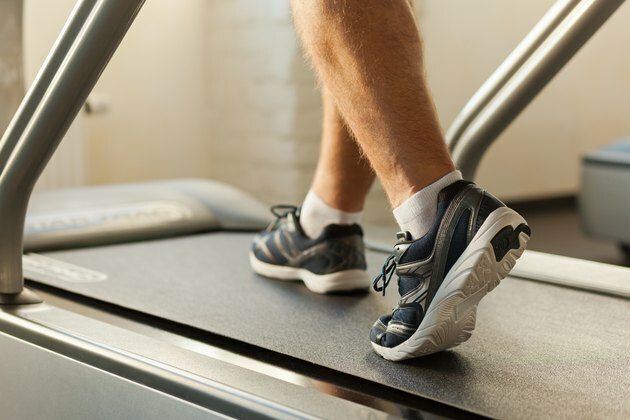 Exercise for the treatment of bradycardia concentrates on improving your heart fitness level by increasing your heart rate for an extended period of time. Check with your doctor first. Treat walking as cardiovascular exercise for the treatment of bradycardia. Walking provides the most effective exercise for improving heart health due to its ease, low dropout rate and simplicity, according to the American Heart Association. Walking provides a low-impact endurance workout that strengthens your heart, lungs and circulatory system, according to the National Institute of Aging. Start out walking at a comfortable pace for 10 minutes to get your body used to moving. Set a goal of walking 150 minutes weekly at a moderately-brisk pace to receive the most cardiovascular benefits. Increase your time in five-minute increments to avoid overdoing it. When walking at a moderately-brisk level, the inability to carry on a conversation is a sign of overdoing it. Remember to wear well-fitted shoes and drink plenty of water to keep your body properly hydrated. Get your exercise by joining walking groups, walking indoors at your local mall or walking by yourself on outdoor pathways. Exercise for the treatment of bradycardia can fit into your daily routine. Find ways to become more physically active throughout the day by making small changes to improve your heart fitness. The American Heart Association suggests getting off the bus stop a couple stops earlier so you end up walking further to your destination. Increase your daily walking by parking your car farther away from the building entrance. Walk your dog for 30 minutes daily. Instead of taking stairs or elevators, walk to burn more calories and improve your heart health. Take a lunchtime walk instead of sitting in the lunch room. Shoot for a goal of walking 30 minutes or more daily in order to receive as many cardiovascular benefits as possible. Some individuals with consistent bouts of bradycardia may be unable to exercise on land due to joint ailments, excessive pain or limited mobility. Exercising in water provides an enjoyable and effective alternative. Water's natural buoyancy supports the majority of your body weight, taking pressure off your joints and making movements more fluid and less painful. Start by doing some water walking, according to the Arthritis Foundation. If new to exercising, start out at a low intensity by getting into chest-deep water. If you have been physically active, start out by using shoulder-deep water. While using your normal gait of swinging your arms and placing your feet from heel to forefoot on the pool's floor, walk one pool length. Relax 20 seconds. Walk back to original position. Gradually increase your time in five-minute increments. Remember to drink water to stay hydrated. Bicycling can be an endurance exercise for the treatment of bradycardia. Start riding a stationary bike indoors by setting the tension to zero and pedaling at a comfortable speed for 10 minutes. When riding outdoors, wear proper attire and start by riding on even pavement for 10 minutes. As you become stronger, increase your duration in five-minute increments while pedaling faster.